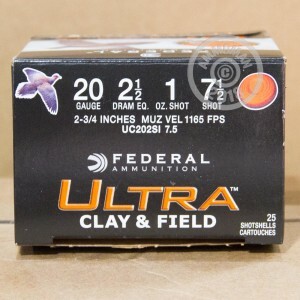 These 20 gauge shotshells from Federal are a great way to enjoy a day at the range or in the field. 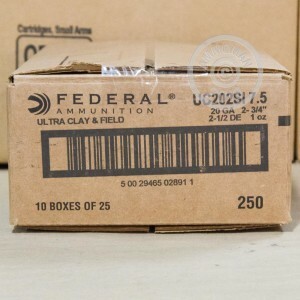 Each shell in this box of 25 fires an ounce of #7.5 birdshot at a muzzle velocity of 1,165 feet per second. Their consistent performance and price make them ideal for both bird and target shooting. 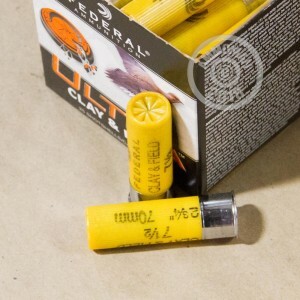 Like other Federal sporting ammo, these shells are loaded in Minnesota. With a good 20 gauge in your hands, you can shoot all day and not have to worry about wearing yourself out. Take advantage of that and buy in bulk at AmmoMan.com, where all orders over $99 ship for free!